Every summer there are a few fun weekends on the water that unfortunately take a turn for the worse. Often, these accidents could have been prevented with just a few simple precautions. Review the following boating safety tips, courtesy of our partners at Safeco Insurance, to prevent an accident from wrecking your fun. Watch the Back of the Boat. Carbon monoxide kills in minutes. Be sure to tell your passengers where your exhaust pipes are located and turn off your engine when people are in the water. Don’t let passengers “ski” or “teak-surf” by holding on to the back of the boat. Both Washington and Oregon made teak-surfing illegal in the last few years, after several tragic deaths. Carbon monoxide detectors are standard on most new boats; older boats install devices for less than $100. Alcohol and Boating Don’t Mix. More than 50 percent of drownings result from boating incidents involving alcohol. Just as you shouldn’t drink and drive, don’t boat and drive. At Eaton & Berube Insurance, your safety is our top priority, and a crucial part of remaining protected on the water is to ensure that you have the right insurance coverage. 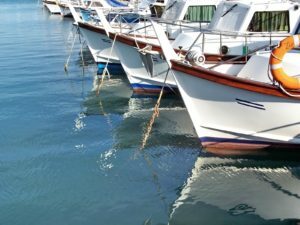 While most home insurance policies provide limited coverage for boats, in many cases watercraft insurance is your best bet if you own a boat. This type of policy typically covers theft, damage, and injuries or accidents while you’re on the water, as well as some watersports gear. Contact us today at 603-882-2766 or info@eatonberube.com to learn more about boat insurance in NH and to get a free quote.